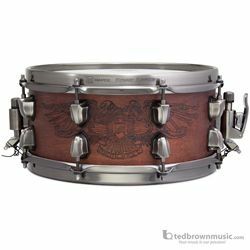 Possessing a mix of fury and deadly precision, this drum delivers an intense, dark punch when tuned low and an explosive pop when cranked high. The thin hybrid maple and walnut shell makes this drum perfect for a main snare when tuned high and is excellent for use as a auxiliary side snare. The SONIClear™ bearing edge increases tuning range and makes tuning easier and quicker. The small 12" x 5.5" size enhances articulation so that even the softest ghost notes don’t get lost.